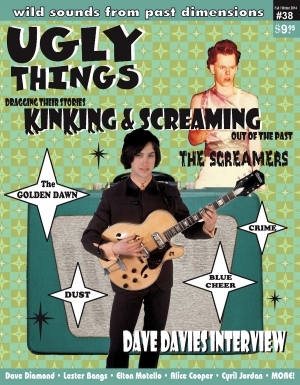 For our headlining feature this issue, we have a massive, exclusive, detail-packed interview with Dave Davies of The Kinks by Richie Unterberger, who also got access to internal memos from Warners/Reprise (the Kinks’ US record company) that shed new light on the band’s story. Also… a big story on US ‘70s art punks The Screamers, including an extensive unpublished 1978 interview by Jon Savage, rare photos and more. And there’s lots more: Texas garage-psych icons The Golden Dawn, cult hard rock trio Dust, Swedish beat innovator Hazze Hep, Dutch beat group The Lazy Bones, ‘70s punkers Elton Motello, Norway’s Borres Kork, Unsettled Society (of “17 Diamond Studded Cadillacs” infamy), Blue Cheer, Vanda-Young’s Marcus Hook Roll Band, the early years of Lester Bangs, Rhino 39, and mind-melting interviews with Dennis Dunaway (Alice Cooper), acid folkster Marc Brierley, and Johnny Strike of Crime. Cyril Jordan of the Flamin’ Groovies shares his experiences of 1968, and we take a journey deep, deep into The Diamond Mine with legendary DJ Dave Diamond. And, as always, our comprehensive review sections covering all the latest reissues, in-depth, and rock‘n’roll-related books.